Common signs include grease leaking onto the inside of the wheels, vibrations around the CV axle, and clicking noises during turns. Constant velocity axles, commonly referred to as CV axles, are the component which transfers the power from the transmission to the wheels to propel the vehicle forward. They have a flexible constant velocity joint which allows the axle to flex in a variety of ways in order to accommodate for wheel movement created during turns and when the suspension travels. This flexible joint is covered in a rubber boot that is referred to as the CV Boot. This boot serves as a simple dust cover for the CV joint meant to keep out dust and dirt, and keep in the grease that lubricates the CV joint. 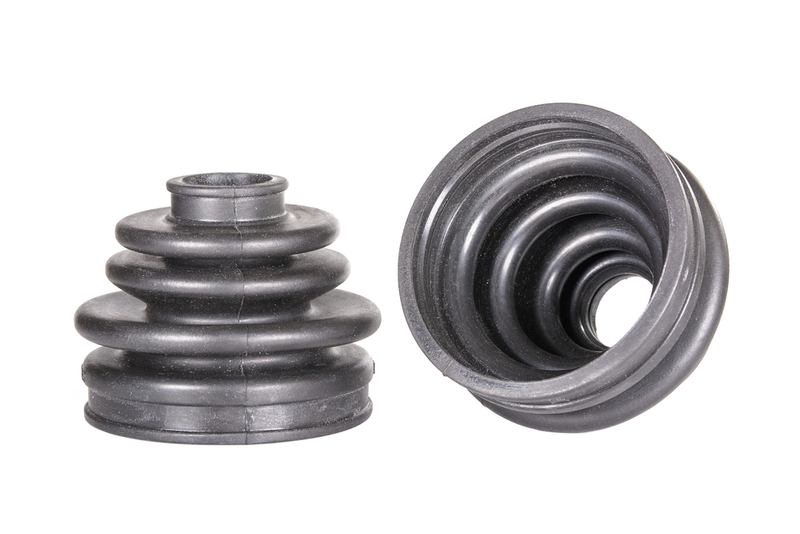 When a CV axle boot goes out, it opens up the potential for the CV joint to become damaged by contamination. Usually a problematic CV boot will produce a few symptoms that can notify the driver that attention may be required. A grease leak is the first symptom that is most commonly associated with a bad or failing CV boot. Over time, with exposure to the elements a CV boot can become dry or brittle and crack or tear. When a CV boot cracks or tears it will usually leak grease onto the inside of the wheel. Often times the grease can also be flung onto the chassis or other parts on the underside of the vehicle as the CV axle turns. A torn boot can also allow dirt, debris, and moisture to enter the CV joint, which will damage the joint. Another symptom of a bad CV boot are vibrations coming from the CV axle. The vibrations may be a result of moisture or debris getting into the CV joint and causing damage. Usually a vibrating CV axle will need to be replaced. Another more serious symptom of a potentially torn CV boot are clicking noises from the axle during turns. This is a symptom that the CV joint has become loose to the point where play has developed, causing it to click during turns. A clicking CV joint will need to be replaced, as most CV joints are usually not serviceable. CV boots serve a simple but important purpose and allow the CV axles and joints to stay clean and enjoy a long service life. If you notice or suspect that your CV boot may be damaged, have a professional technician, such a one from YourMechanic inspect the vehicle to determine if a CV boot replacement is appropriate, or if the entire CV joint should be replaced.